How you can make a difference and be an armchair traveler to the 2012 Social Good Conference in NYC! 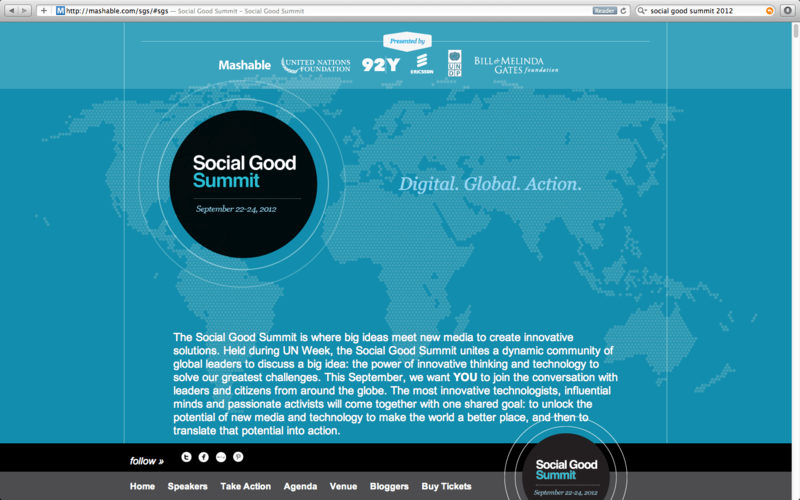 A screenshot of Mashable’s site on the Social Good Summit. I am thrilled to be taking my life and blog one step further in my quest to write and advocate about Social Good, by attending the upcoming 2012 Summit for Social Good being held in NYC this September! I have heard a number of amazing things about this conference and can hardly wait to hear all the phenomenal speakers that will be talking about innovative ways to use social media to change the world. “Mashable is hosting our third annual Social Good Summit from September 22-24 at 92Y in New York City. Held during UN Week, the Social Good Summit unites a dynamic community of global leaders to discuss a big idea: the power of innovative thinking and technology to solve the greatest challenges facing the world today. This September, we want YOU to help us make history and join the conversation with leaders and citizens from around the globe”. “Using Meetup Everywhere, you can organize or attend a Mashable Meetup in your own hometown or anywhere in the world”. “Our goal is to highlight the voice and ideas of people everywhere, both during and after the Social Good Summit event. The global social good community will become one by tackling the same question, exchanging information and sharing the same spirit and the same hashtag: #SGSglobal”. “We want to create one of the biggest and most powerful global conversations the world has ever seen. And we want you to join us! So sign up for a Meetup now and get engaged, express your thoughts and help to improve your local community and in turn, the world around you”. “The 2012 Social Good Summit is brought to you by Mashable, 92nd Street Y, the United Nations Foundation, Ericsson, the United Nations Development Programme and the Bill & Melinda Gates Foundation”. *Above content all taken directly from Mashable’s announcement. Click here to read in full. Photo taken in July “on top of the Rock” when I was in NYC for BlogHer. Didn’t’ think I’d be back so soon! I had heard so many positive remarks about this conference from fellow Social Good bloggers that I knew I had to find a way to attend. Thankfully I’m able to swing it and can hardly wait to attend and learn more about what we can do to change the world. Well guess what? You can attend to! The conference is open to all blogger, activists, expert entrepreneurs and interested parties and it is free to bloggers! All you have to do is submit an application here. Better yet, if you can’t physically attend you attend via cyberspace. The entire conference will be shared via social media around the world. There will also be opportunities to host your own Social Good Summit in your backyard via meet-ups. You can also be a part of the global conversation by clicking here. Now if you really want to get inspired, check out the outstanding list of speakers (click here) and watch this YouTube video on “What to Expect from the 2012 Social Good Summit”. Come on and join me! We can all work together to make the world a better place! So excited that you are going, cannot wait to hear all about it. That would be fabulous! Another blogger I know is also attending! I think it is going to be pretty amazing. One blogger told me she attended two years ago and it changed her life. Pretty high expectations but judging by the speakers, I think it will truly be amazing! Hope to see you there! Will check out the site and take part if I can. You are inspiring. I will have to go check out all the links you posted. Can’t make it to NY, but will check out the online possibilities.